I used to be a fan of wind power. 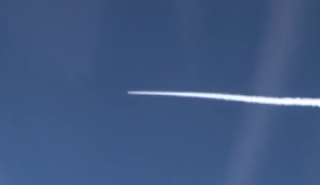 We were told that a new generation of wind turbines were reliable and efficient. At times, one can see a certain beauty in the rotating turbines of wind farms. However, my opinion changed when I began researching wind energy during my global warming project. To make a long story short, the current generation of wind turbines are still very inefficient and prone to breaking down. Europe has suffered a number of blackouts and brownouts due to the reliability problem. The unreliability is so great that electric utilities still have to run their generators when they are using wind power in case the wind ceases or a wind turbine shuts down. The generators are run "off-line" but they are still consuming energy (rather than producing it). 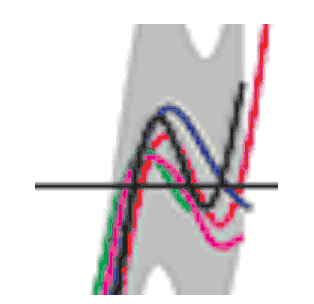 When one considers the energy needed to run the generators, there is little net power being produced by the turbines. 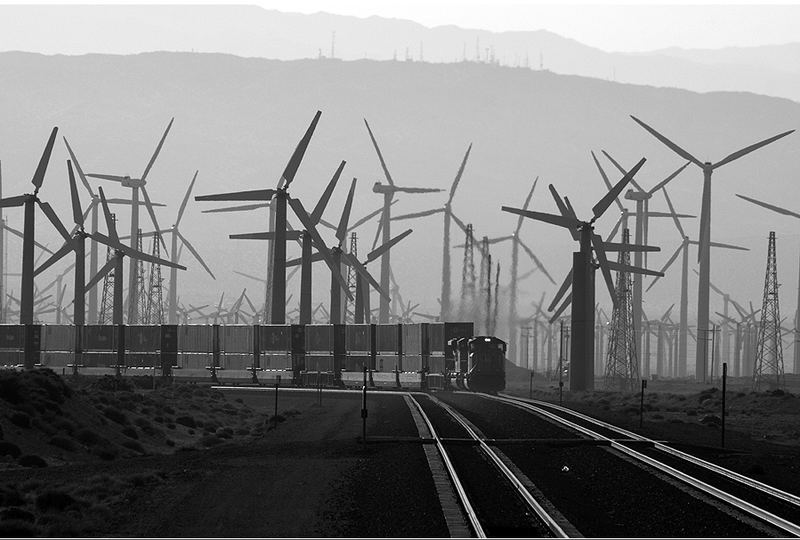 The photo above was posted at Trainorders.com showing a Union Pacific stack train passing the wind farm near Palm Springs and the thought occurred to me: People object to oil wells and oil platforms because they "ruin the view." The wind towers are at least as bad. And, unlike oil, which we know is an energy-dense substance with real value, the wind farms may be rusting eyesores ten years from now if the heavy government subsidies for wind power cease. I strongly believe we need much more nuclear and more solar. 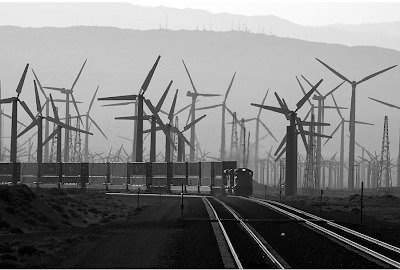 Wind power is not ready for prime time. On many occasions, I have criticized climate science for its overreliance on obviously flawed computer models. This story from the Wall Street Journal explains how hard work in a hostile location may lead to higher levels of understanding the workings of our climate system. 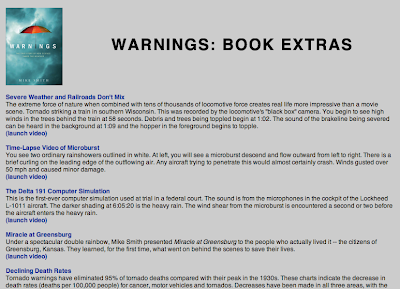 I continue to get questions about the "Extras" available to purchasers of Warnings. 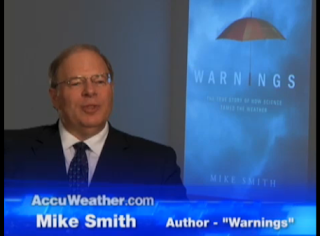 If you would like to view the videos available to purchasers of the book, go to www.warningsbook.com . Then, turn to the copyright page (the page opposite the acknowledgements) and enter the numbers at the bottom of the page (without spaces). That unlocks the "extras" site. Enjoy! I'd appreciate any comments you might wish to make about this feature. Feel free to post in the Comments section below or email me. An interactive Sistine Chapel can be accessed here. You can pan around, zoom in on the paintings. etc. Highly recommended. 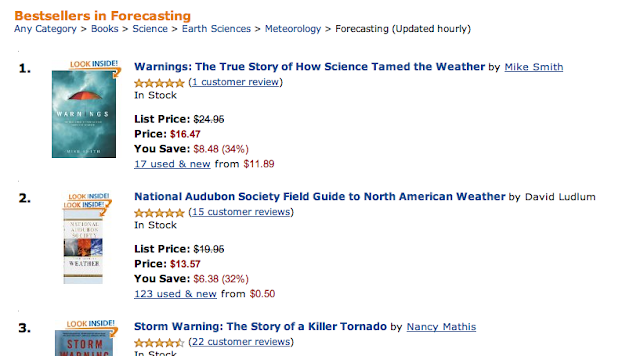 When I saw the number of "used" copies of Warnings offered for sale at Amazon increase this morning, I was curious as to what was going on. One might assume that people read it, turned it in to a reseller for a few dollars, then the reseller marked it up and offered it for sale. In a number of cases, what is offered for sale is described as the "soft cover" edition of Warnings. Only one problem: There isn't one. What they are talking about is the Advance Reader Copy (ARC) which is created by publishers for reviewers and for wholesale book buyers. There are significant differences between an ARC and the actual book. The ARC is the second-to-final edit and has a number of typos and, in one place, a transposed paragraph. The photos are in black and white (the final book has a 16 page color insert). The cover information is not the same as the dust jacket. There are photos in the final book that do not appear in the ARC. Some people collect ARCs (an original Harry Potter ARC is said to be worth tens of thousands of dollars) because few of them are produced. I have one box (15) of them left and I would offer any collectors the opportunity to buy pristine ARC's for $15 (including tax and shipping). But, note the lower price than the book. The color pictures really make a difference and, I believe, make the actual book the version to purchase. In any case, I wanted to make clear what is occurring because I don't want some to purchase one of these "used" 'copies' of Warnings and end up believing the actual book has typos and black and white photos. Here is an article in The Economist that makes the same points in greater detail. Hat Tip: Roger Pielke, Sr. But, the engine shut down prematurely at Mach 5. 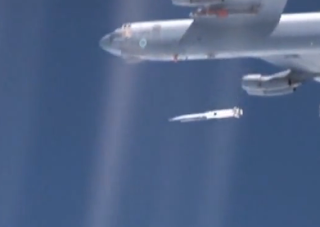 It was supposed to reach Mach 6. Is Mach 5 where "the old demon" resides? They'll find out when they try again after what was called a "95% successful" test. No word as to whether any Beeman's was involved in yesterday's exploits. The step-by-step process of learning by doing continues in today's world of science and technology, just like it did sixty years ago. Computer models and flight simulators (a more realistic computer model) are useful, but, eventually the thing has to fly! The image and article were cut-and-pasted from The Miami Herald. 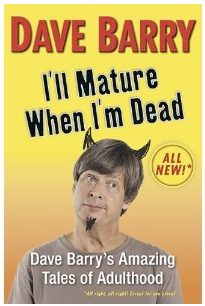 I'm a little surprised it didn't have Dave Barry's byline. 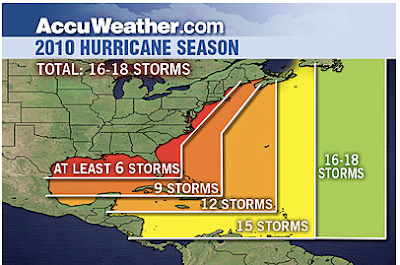 Joe Bastardi has updated his 2010 hurricane forecast and which includes the above innovative graphic. If you live along the coast, please click on the link above for important additional information. UPDATE: This map provides an illustration as to why forecasting rainfall amounts is so difficult. 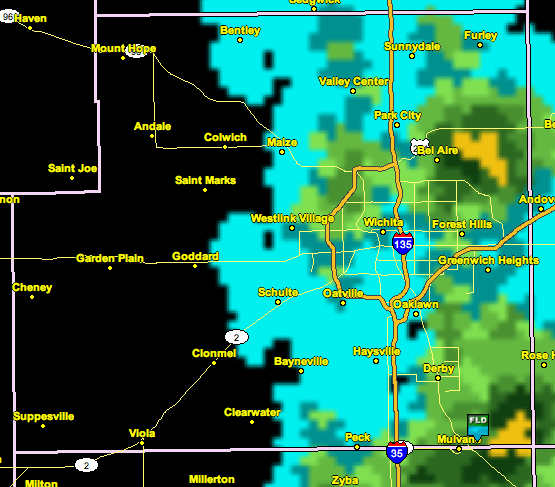 Western Sedgwick County received no rain at all (black). 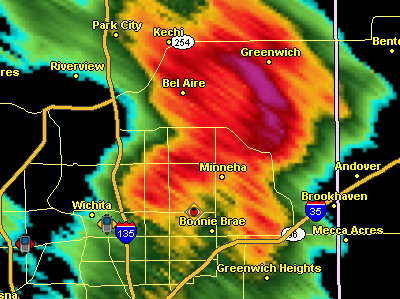 Northeast and southeast Sedgwick County received more than three inches (yellow) with flash flooding. In some cases, the distance between three inches and 0.25" is less than two miles. 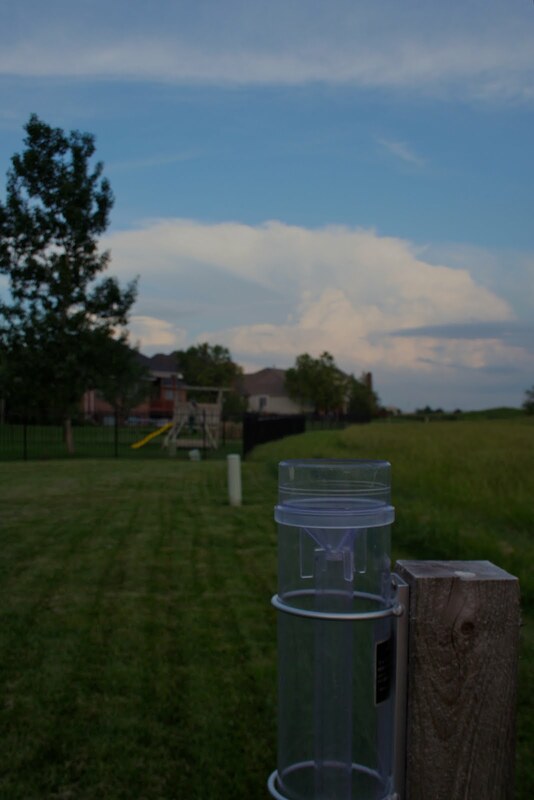 After completely missing out on the first two rounds of storms we had 1.46" at my house. 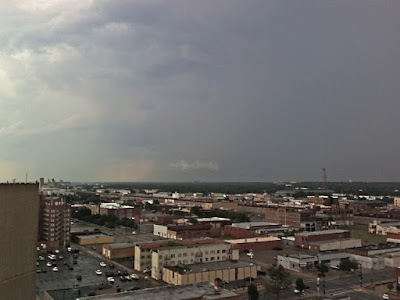 The various gust fronts (the rain cooled air spreading out under a thunderstorm) finally converged on north Wichita. The cool air lifted the warm unstable air and created a new thunderstorm. 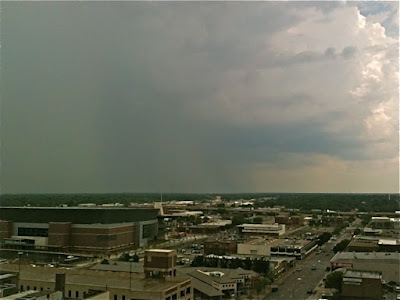 Here is that thunderstorm in northeast Wichita. Jabara Airport picked up 0.67" in less than an hour with the rain still falling. Yesterday was the anniversary of the birth of Marion Michael Morrison, better known as John Wayne. For younger readers, he often played a heroic soldier or cowboy who would try to bring justice to the frontier. He also could laugh at himself. 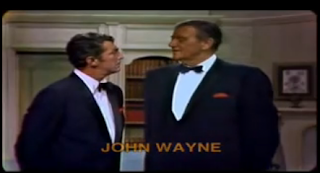 Click here to see a tape of The Duke's appearance on the Dean Martin Show. My kids never seemed to "get" my John Wayne impressions ("how ya doin', pilgrims") but after watching this tape, I think they weren't so bad. The first time the family ever landed at the John Wayne Airport in California, I dragged the kids over to see the statue of The Duke ("we want to get to Disneyland!, why do we have to see this statue?"). "A man's gotta do what a man's gotta do." At first those words seem trite, but they are profound. Think about the men who rushed into the Twin Towers on September 11. 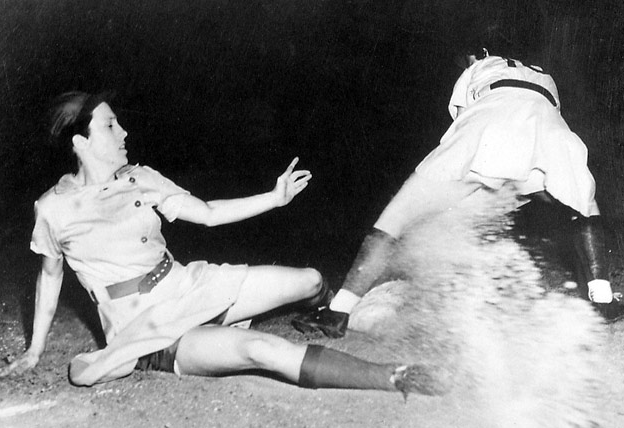 In contemporary American culture, the role of men is too often denigrated. 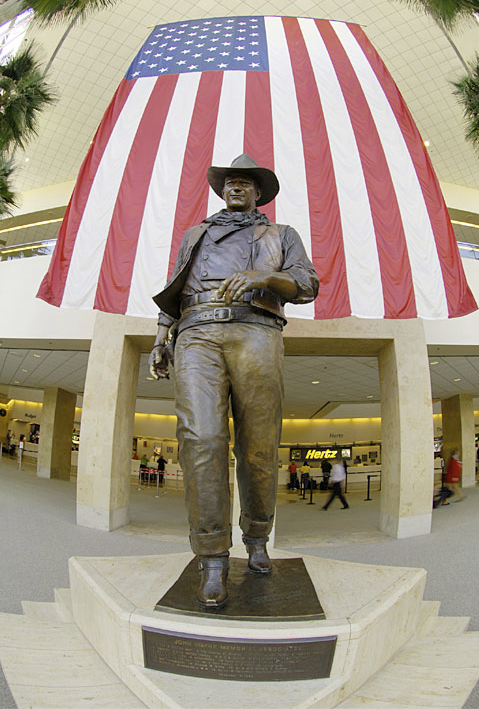 That's why I wanted my children to see the statue and know the values John Wayne embodied. Although it is a day late, happy birthday Duke! 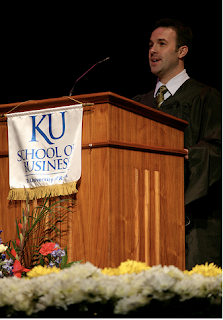 Get out the gloat meter: The proud father is thrilled to post photos of his son giving the student commencement address at the University of Kansas. Richard graduated with his MBA and is now working with Sabre Holdings in Dallas. 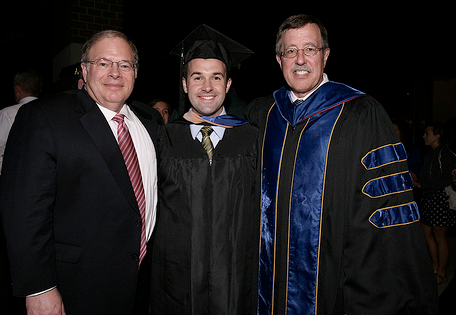 Below we are pictured with Bill Fuerst, the Dean of the School of Business at KU. Okay, I get why people who buy Warnings would buy Paul Yeager's book, a book about 'global warming' (even though Warnings doesn't mention that topic), or even a book about Wall Street. But, the biography of Oprah? I must have a more diverse audience than I realized! Taken at 10:15pm. Lightning approaching from the southwest. The lightning was diffused by clouds, so you don't see lightning strokes. 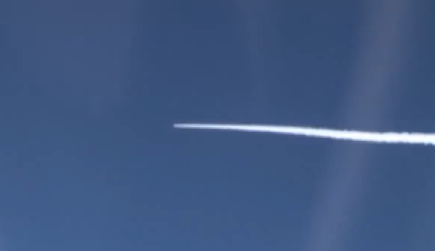 The light colored line from left center was an airplane trying to land ahead of the storms. Things look blurry because it is windy and the trees were in motion while I was doing the time exposure. 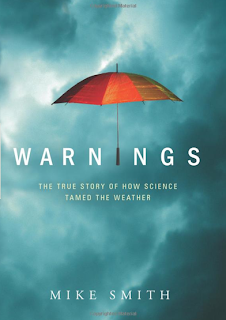 Warnings: The True Story of How Science Tamed the Weather. I should say up front that I am a brother of the author, Mike Smith. Now, being a younger brother, that could mean one of two things; A) I am writing an excessively positive review because, well, he’s family; or B) It’s a great chance to get even with him for all the younger brother things that were done and are still being done to me to this day; like, for example, him writing a book and therefore making me look bad since I never have nor do I ever expect to write a book; or, always having my grades in school compared to his grades in school; and guess who got his own room while my other brother, Phil and I had to share. MOM ALWAYS LIKED HIM BEST; but I digress. The reality is, Mike has written a darn fine book, as much as I hate to admit it. With a brother who was always into weather (and great at it), I learned a little about weather myself, I suppose through osmosis. I’m even one of those people who actually enjoy watching the TV weather warnings “interrupting our regularly scheduled programs”. But, I suppose, that’s the main point of the book. Back in the day, weather warnings, once they started giving them, were often too late and ”If you can hear the sound of my voice, head to the basement or shelter; AHHHHH!! !” Heck, we were in the basement it seemed like every other night in the late spring and early summer because the weather dudes weren’t capable of anything better. 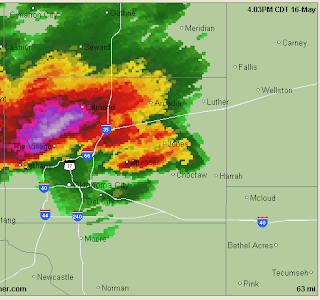 “Somewhere in the 150 mile radius of the TV signal, there’s bad weather, so TAKE COVER! Now back to our regular program; we’ll be back to let you know when you can come out of the basement”; oh wait, each house only has one TV and it isn’t in the basement so try that transistor radio that gets terrible reception in the basement (and probably has dead batteries) or better yet, keep an ear out for the all-clear siren (what’s the difference?). So, Dad has to go upstairs every once in a while to check the TV with Mom yelling “Get back down here; you could get yourself killed and I’m not about to raise these brats alone.” At times, it was almost like crying wolf because it happened so often for everyone. With today’s advances, there’s usually plenty of warning. 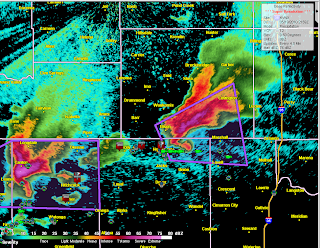 Heck, they usually know when a funnel cloud is going to form based on advanced radar detection. Then they show us the exact path of the storm and who should really be worried; and as the storm progresses, who should then be taking cover. All this is intertwined with entertaining and educational stories of actual storms that, in the more distant past, destroyed whole neighborhoods or towns while killing hundreds or even thousands, compared to similar storms today that are more likely to have minimal numbers of tragic deaths. Or planes that crashed back then, but don’t now because of modern wind shear warnings. It’s all the more interesting because we can personally relate to most the stories because they happened close to where we live or were major news sometimes for days or even weeks; ie. Hurricane Katrina. So, put down your romance novel of the month or the James Patterson book of the week; how much of that stuff can you read anyway? 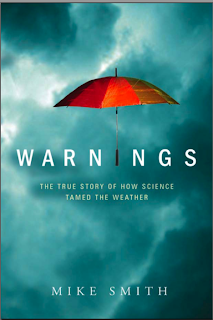 Read “Warnings” . Enjoy some real life drama and learn a thing or two along the way. Elder of Mike’s two younger brothers so I was at least able to pick on Phil. Tornado (red) and severe thunderstorm (blue) watches extend from border to border in the central United States. The post below documents a rather upset woman complaining to a television station about its weather coverage. Some of these difficulties could be prevented if TV stations better explained their severe weather coverage policies. 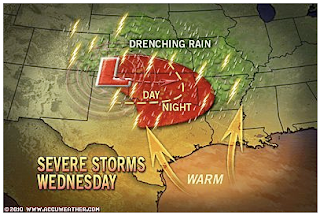 While researching some items about TV weather, I ran across this well-presented severe weather policy statement at the website of KCTV (CBS) in Kansas City. I suggest that other TV stations consider making their severe weather coverage policies easy for their viewers to access and read. 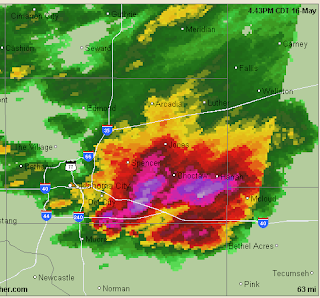 Many times, I have bragged about meteorologists' ability to accurately warn of tornadoes. The problem we have is too many false alarms. 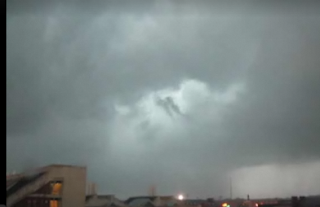 This video from NewsOK shows the rotation Wednesday evening moving over Stillwater, Oklahoma. You can see both the rotation and the brightness associated with the "rear flank downdraft" which we believe is important for tornado spinup. Radar showed the rotation, the rotation was there, and the ingredient for the spinup was there. 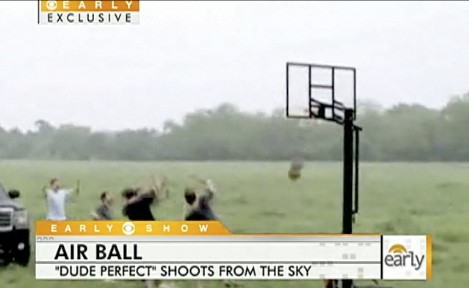 Yet, no tornado. We simply don't know why this was the case. Until we get it figured out, we have no choice but to warn. 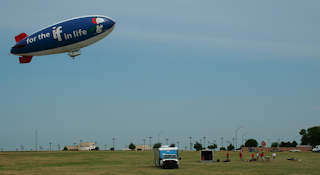 While in Dallas-Ft. Worth for the book tour Tuesday, we saw the MetLife blimp landing behind the Ft. Worth office of the National Weather Service. It is there for the Byron Nelson golf tournament which is played this weekend. 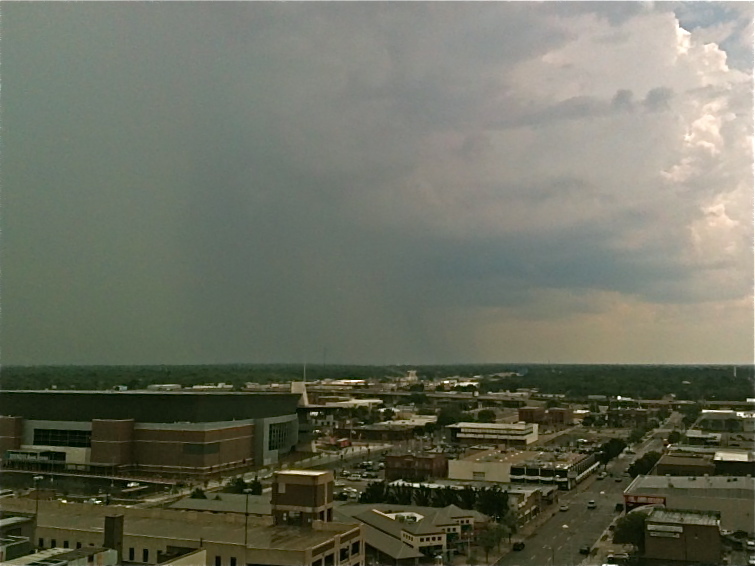 The NWS office is the sand-colored building at left. The large white dome is the radar that tracks the weather balloons they launch. To the right is a large satellite dish and, to the right of that, a tornado siren. Local emergency management officials placed the siren there not because it is an NWS office but because it happened to be the perfect location to fill a gap in coverage. I will be presenting Miracle at Greensburg and signing (and selling) copies of Warnings at Wichita's Exploration Place tomorrow (May 22) at 1pm and 3pm. Hope to see you there! Today is the 53rd anniversary of the Ruskin Heights Tornado, a night that will never be forgotten in south Kansas City. 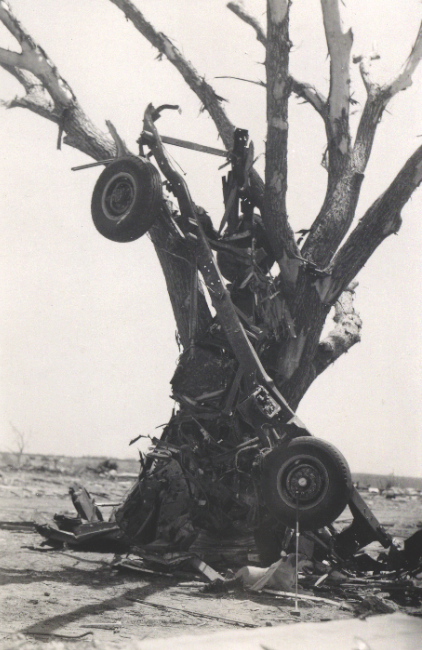 Forty-four were killed by an F-5 tornado that cut a 75+ mile path from Williamsburg, KS to eastern Jackson Co., MO. 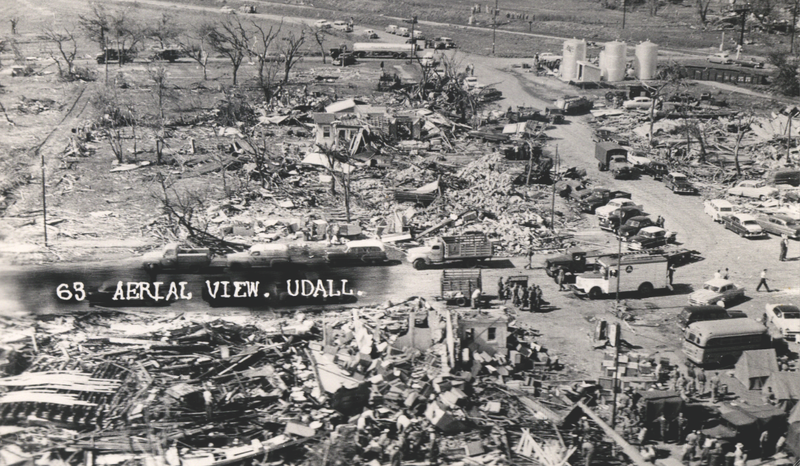 It was that tornado, along with seeing the damage it caused the next day, that convinced me to become a meteorologist even though I was only five years old. 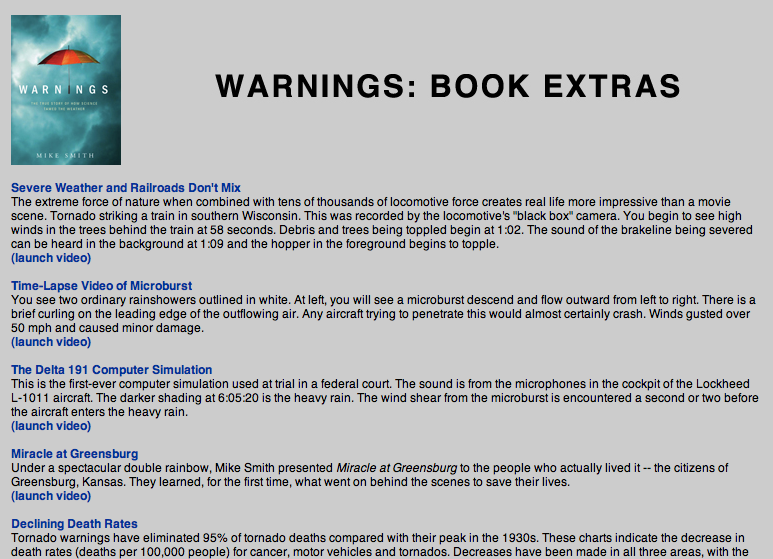 A few of the tragic stories of that night are recounted in Warnings. For example, this is the grown-up Bobbi Davis. She was in the car that was lifted and thrown into the Ruskin water tower while trying to escape the tornado. The car came to rest next to the Kansas City Southern Railroad tracks. Her mother, father, and sister were all killed. Bobbi was hospitalized for a month. Preventing deaths and injuries is the primary goal of the meteorological profession. 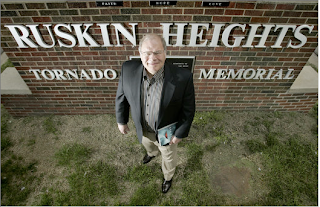 The Kansas City Star recently ran an article about the Ruskin tornado and my book. The online version is here. 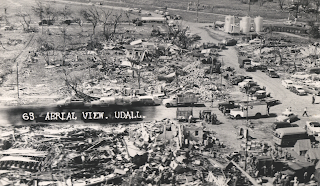 The national civilian tornado warning system was born that night due to the work of Joe Audsley. 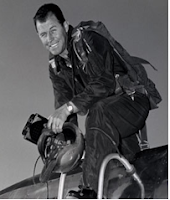 Had Joe not "bucked the system," it might have been many more years -- and thousands of lives -- before the Weather Bureau started issuing tornado warnings. I get emotional writing about that evening -- it was the defining moment of my life (it even had a role in meeting my future wife). 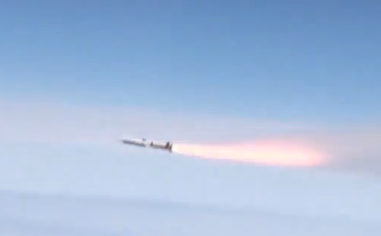 Lets hope the Vortex II research project, now in progress, results in even more life-saving knowledge. Is it me, or does each new Olympic mascot reach new lows of dopeyness? 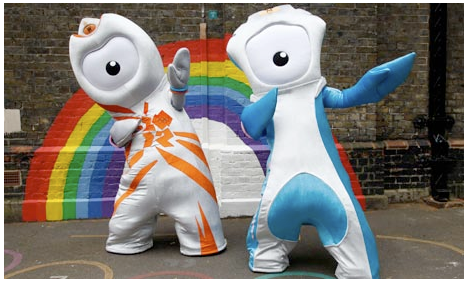 This pair of -- ah, er, something, are the new London Olympics and Paraolympics mascots. 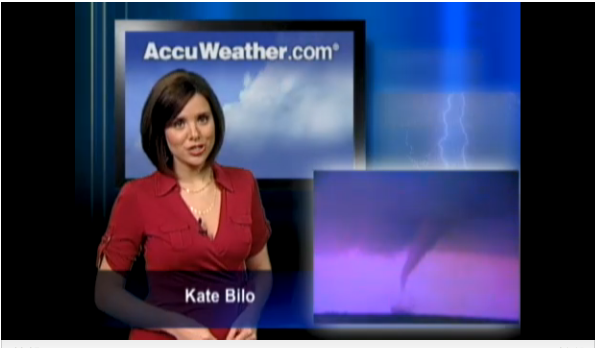 UPDATE: Report with Kate Bilo here. Classic hook echo that has already produced a large tornado headed for Interstate 35 north of Oklahoma City. 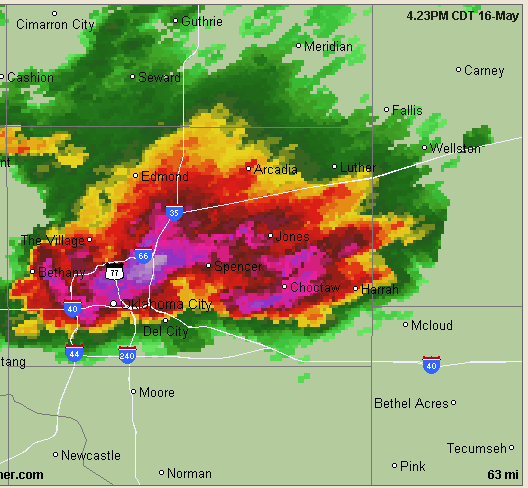 Second storm near Canton, OK is producing giant (radar indicates softball) hail. This article contends that we are in for a period of increased volcanic activity. Dr. Joe D'Aleo, CCM, a long time friend, wrote years ago that one of the reasons for the warming of recent decades was the low level of volcanic activity. That may be coming to an end. 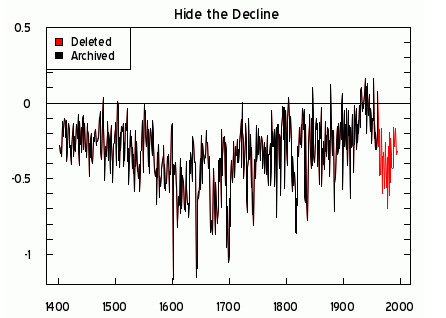 The computer models forecasting global warming do not allow for volcanic activity. The seeming increase in volcanic activity a reason why I believe the U.S. needs to institute a high quality volcano watch/warning program using the existing meteorological infrastructure. 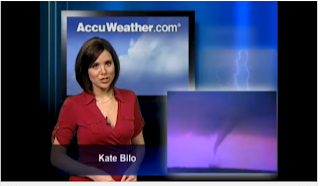 Here is an interview about Warnings conducted by AccuWeather's Kate Bilo. AccuWeather's Joe Bastardi is forecasting a hurricane season that might be one of the ten worst in history. Details here. Hurricane season officially begins June 1. Fairfax-A farm, in Fairfax, Oklahoma, where scenes from the 1996 movie "Twister” were shot was hit Monday by a real tornado. J. Berry Harrison Sr. lost a horse, two houses, five barns, two silos and miscellaneous farm and irrigation equipment in the storm, but his family was not hurt, he said Saturday. 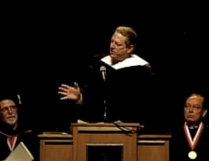 "We built all this in 50 years and it blew away in 15 minutes. It was quite a wind,” he said. Harrison’s son and wife, their son and a niece were in one of the homes when the tornado hit. He said the house lost its roof, but the walls stayed intact. During the filming of a scene in "Twister,” film crews tracked actors along a road and taking shelter beneath a bridge as a tornado passed over. 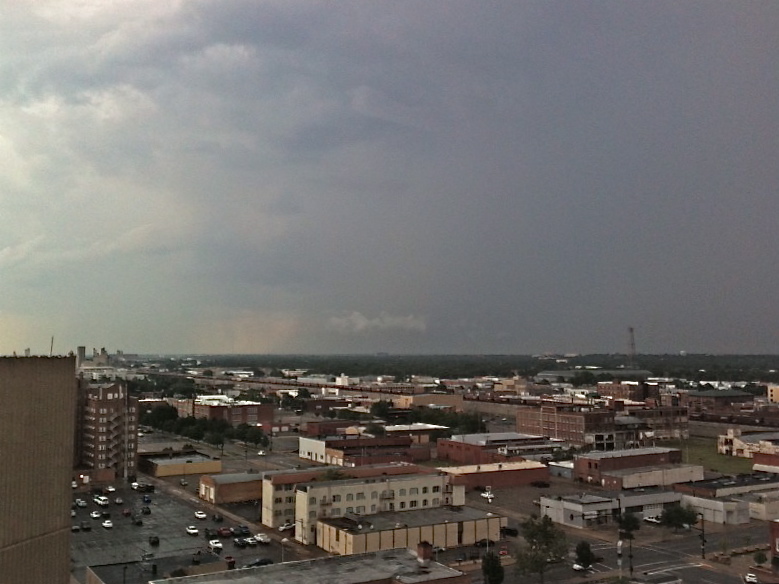 The track of the fictitious tornado in the film and the real one that hit Monday appeared eerily familiar, Harrison said. "The path of the tornado came exactly the same way that they made it in the movie,” he said. I often get asked whether other nations have tornadoes. Here is one in Serbia courtesy of AccuWeather. "Warnings" would make a great graduation gift for anyone interested in weather. Here is the Amazon listing. 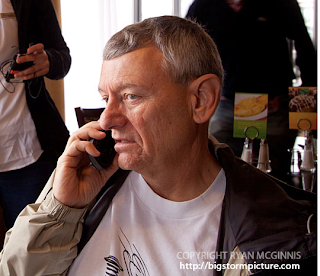 Or, if you would like to get an autographed copy, please send $30 (which includes the book, shipping, and sales tax) to Mike Smith Enterprises, LLC, 4031 N. Tara Circle, Wichita, Kansas 67226. Please let us know how you would like the inscription to read. Reports coming in indicate the Oklahoma City area, hard-hit by tornadoes six days ago, has suffered a major hail storm. One TV station had its skylight broken out while live on the air. Congratulations to the new Miss USA, Miss Michigan, Rima Fakih. Last month, I blogged about Phil Ruffin. Turns out he was a judge at last night's Miss USA Pageant. That's Phil on stage immediately after the Pageant, no doubt thinking about how far he has come in his remarkable life.